India needs new cities. The nation’s metropolitan areas are overcrowded, and those who want to leave rural areas are having difficulty finding places to live and work. According to Anup Malani, Lee and Brena Freeman Professor of Law, as many as 16 million new people are coming into India’s cities every year, and the situation is getting worse. Fortunately, among the organizations and individuals who are doing something about this crisis are recent University of Chicago graduates who have found a role to play through the International Innovation Corps. Malani founded the IIC to bring the talents and education of UChicago graduates—including College, graduate school, and professional school alumni—to some of the most challenging problems in the third world. Fifteen Chicago grads, or Fellows as they are called in the program, came to India last August, and five began work with the Delhi Mumbai Industrial Corridor Development Corporation (DMICDC), a government-run $90 billion infrastructure program that will run new train lines between the two megacities and that plans to build twenty-four new cities in the corridor itself. The IIC fellows worked on one of those planned cities. In addition to planning cities of the future, IIC fellows are implementing microgrid solar power technology in villages without access to the electrical grid and are developing training programs for the Indian textile industry, the third-largest industry (by employment) in the nation. But such work is just the beginning. The program, which was first conceived in the fall of 2013, has just begun its second year, and its leadership could not be more excited about the changes the Fellows will bring in years to come. The 2014 class of IIC Fellows included eight graduates of the College, two graduates of other parts of the University, and five graduates of Indian universities. The idea to create IIC came to Malani while conducting his own research. Since 2010 he has been studying how health insurance can be provided to more low-income individuals and families in India. While undertaking this study, Malani kept coming across government officials who were looking for assistance in many different areas. For example, one official asked for help with how to clean up a database of information on household assets so that such information could be placed on cards that individuals could carry with them. The portable cards would make it easy for them to sign up for a variety of government services all at the same time. “The questions and requests for help kept coming in and I thought that these were really neat problems to solve, but I simply didn’t have the bandwidth to do it.” The government officials sought help because the Indian government, which does not pay well, has a shortage of well-educated, well-trained employees. “Talented graduates there are going into the private sector,” Malani explained. Then he met Sanjay Bhargava, one of the chief business architects of PayPal, in June 2013. Bhargava also felt that that the Indian government was interested in taking on intriguing projects but was unable to execute them because of a lack of trained labor. During their conversation, it occurred to Malani that back in Chicago, he had just the opposite problem—he had access to lots of skilled and educated new graduates who were eager to make a difference but could not find public-interest jobs with decent pay and a high level of responsibility. “I realized we had to figure out a way to bring the skilled labor from Chicago to India. And we had to raise funds for competitive wages, wages that the Indian government wouldn’t or couldn’t pay,” Malani said. 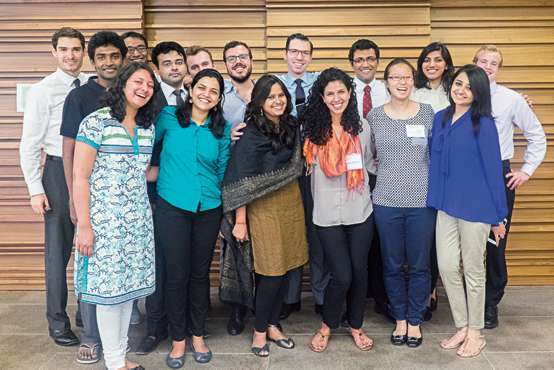 Malani, Bhargava, and Phoebe Holtzman, who led development and operations for Malani’s health insurance project, decided that they could raise philanthropic funds to provide both expertise for the Indian government and good jobs for the potential fellows. Over the next several months, the trio began searching for funding with assistance from the University’s Office of Alumni Relations and Development. By February 2014 they had funding in place for three projects and began active recruitment. They hired both Chicago graduates and accomplished Indian university graduates to join the project. “The idea is that, while we pay less than our graduates might make if they joined corporate America, the cost of living is so low in India that if they take these jobs they will have the opportunity to save a lot of money,” Malani explained. “And these salaries are quite high for Indian graduates, which means we could attract some of the best that their universities have to offer.” Moreover, along with good pay, these jobs offered levels of responsibility that new graduates rarely acquire. After a year in the program, the Fellows have high-level government and industry contacts in a number of different sectors and have significant experience that will allow them to take on more advanced positions than they otherwise might have been able to get so early in their careers. 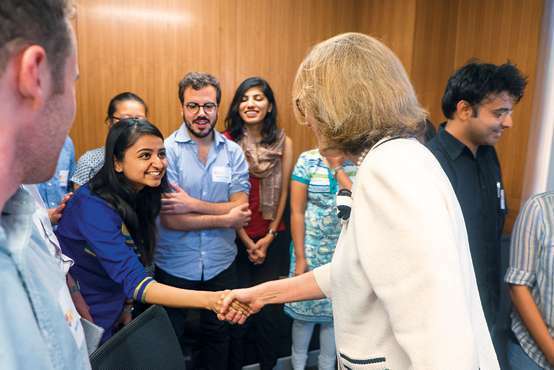 2014 IIC Fellows meet with Kathleen Stephens, US Chargé d'Affaires in India, at the Center in Delhi. Ayesha Khan is an IIC fellow who was educated in India. An attorney who trained at the National University of Juridical Sciences, she spent two years at a law firm working on corporate, contract, employment, and intellectual property law before joining the program. Khan was assigned to the National Skills Development Corporation (NSDC) to help create sustainable jobs in the textile and apparel industries. While the textile industry employs between forty million and sixty million people, few of its workers are trained, much of the work takes place in homes, and the lack of uniformity in the products makes sales to companies like Gap and H&M very difficult. Khan spent a year working with the state governments of Gujarat, Maharshtra, Punjab, Karnataka, West Bengal, and New Delhi to initiate training programs for youth and women. “All of these projects involved extensive negotiations with government leaders, strategizing innovative models of skilling, arranging funding from various stakeholders, and, finally, implementation with the relevant industries and skilling partners,” Khan explained. One project she worked on was the Khadi Village Industries Commission, which plans to up-skill a million artisans and village workers in the next five years, thus improving the quality of their production and their livelihoods. “Now I see a lot of change in people’s perceptions towards vocational education, largely due to NSDC’s efforts. People, especially youth, are looking more favorably at vocational training as an alternative to formal education,” Khan added. Mentors are another key component of IIC. Malani finds mentors as he goes about finding projects. The mentors are experts in various fields on both sides of the world who volunteer to answer questions and to direct fellows to specific resources when they need assistance. “The point of a mentor is to help Fellows find their way. None of them has ever designed a city. My role was to lead the students through the process to determine what is important, what they should focus on, and how they could be effective. They received instruction from DMICDC and then they asked for help,” Ellis said. Matthew Klein, who graduated in 2014 from the College with a degree in economics and environmental studies, worked on special projects for the DMICDC. His long-term assignment was determining how best to structure the governments of the proposed urban areas. “These new cities are charter cities, so there are many questions about how their governments can work, what responsibilities cities can have, and what authority they can command.” He also worked on a project focusing on how the central government can best engender the start-up movement. The IIC-CEL team works in Bihar to develop solar minigrid pilots in two villages. Last year, IIC had a highly competitive selection process. Leadership reviewed more than 130 applicants and chose the Fellows whose skills best matched projects’ needs. For example, a team with knowledge of marketing, business, and legal work was assigned to the third project for the 2014–15 year. Central Electronics Limited is a government corporation that manufactures electronics. The team assigned to it was tasked with determining if solar technology can be used for rural electrification in villages not on the grid. They are currently running a pilot program with the government and an NGO. “They are trying to expand this to roughly thirty villages and are also working with the charter city’s team to try to set up LEED-type standards for the new cities,” Malani added. For the 2015–16 year, IIC leadership is hiring between twenty-one and forty Fellows, depending on the funding they receive. They have already gotten generous grants from the Tata Trust to do work in sanitation and sustainable energy and the Michael and Susan Dell Foundation to do work in education. They also have a project with the US Agency for International Development and the UK’s Department for International Development to build out a new social impact fund, in part by providing business incubation services to social entrepreneurs.